For starters, the location itself is pretty original. Maybe it sounds a bit vague. But believe me: the less you know, the better. I was surprised again and again by the various twists. And those twists sometimes come from an unexpected angle. It wasn’t only the way of filming that pleased me, but also the subtlety with which it was all interwoven. Some story elements were shown from three viewpoints. Time and time again in a new storyline. Normally this could lead to confusion. But here it fits perfectly. And this all in a typical 60s setting with accompanying props, appropriate clothing and a Wurlitzer that produced that distinctive Motown sound. 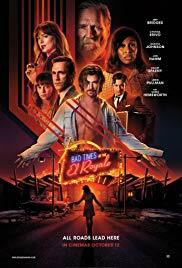 Take “Pulp Fiction“, “Twin Peaks” and “The Hateful Eight” and you get a movie like “Bad times at the El Royale” after a good shake-up. Simply wonderful. Let’s talk about renditions. Actually, there is no character that disappointed. Each has his/her reasons for being there and has his/her own personality traits. It was clear from the beginning they were all enjoying themselves while playing their part. Once more the acting of Jeff Bridges as a priest was a joy to watch. Even though he talks as if he’s nibbling on chewing tobacco or a hot potato as in “R.I.P.D” and “Seventh Son“, I simply thought he was sublime as the priest with Alzheimer’s. And certainly, the interactions between him and Cynthia Erivo are simply great. She also has a beautiful voice that came in handy in a specific splendid scene. Chris Hemsworth. Give that man a cigar. A must see? Yeah sure!